Batam Island or Pulau Batam is part of the Riau Province of Sumatra though it is closer to Singapore, just a 45 minute ferry ride. Both the Airport and the Ferry ports in Batam offer Visa on Arrival. Batam's airport - Hang Nadim International Airport is 20 minutes away from the main town Nagoya in Batam. It is a fixed price of 90,000Rp for the taxi ride. Although named an International airport the international destinations are limited to Kuala Lumpur and Johor Baru in Malaysia. Majority of the flights are internal domestic flights within Indonesia. Air Asia has direct flights to Batam from Kuala Lumpur and Jakarta. www.airasia.com. Firefly Airline is a new Malaysian Airline with direct flights from Batam to Subang airport in Kuala Lumpur, Malaysia. Batam has several Ferry ports, the main ones being Batam Centre and Sekupang. There is no departure tax leaving the ferry ports in Batam. 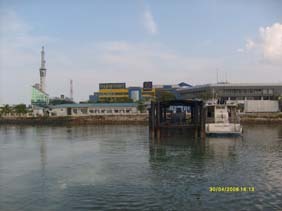 Ferries can be caught to Batam from Singapore, Johor Baru in Malaysia, Dumai and Medan in Sumatra.